Well, what have we here? Yet another eagerly anticipated mobile device is being outed by benchmark tools, and this time it appears to be a new member of Google's Nexus tablet family. TKTechNews managed to dig up an exclusive scoop, revealing a screenshot of Android benchmark software CPU-Z running on what appears to be the Nexus 9 tablet packing some very interesting hardware. The leaked screenshot clearly shows the alleged device running a dual-core 2.5GHz Nvidia Tegra K1 Denver processor, which the chipmaker previously hailed as the first 64-bit ARM processor for Android devices. Aside from the processor specs, the leak offers few clues as to what else might arrive on the tablet, although TK himself confirmed in a follow-up video "Nexus 9" does appear to be the official name for this upcoming slate. 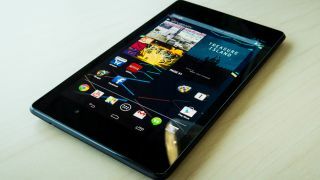 Last month, word began spreading about an HTC-branded Nexus 9, a potentially costlier addition to Google's product line codenamed "Flounder" and/or "Volantis," although the device has occasionally been referred to as the Nexus 8. Expected to run somewhere in the neighborhood of $399 (about £241, AU$427) for the Wi-Fi-only model, the Nexus 9 is said to feature 4GB RAM, NFC, Android L and dual cameras, with 8MP on the main rear camera and 1.6MP around front. In a blog post from August 11, Nvidia boasted about the 64-bit, 192-core Kepler-class Denver chip's ability to offer backward 32-bit pin compatibility, which the company promised would ease the transition for hardware manufacturers and allow them to get their products to market faster. That said, it's still early days for Google's next-gen slate, and there are likely many more leaks to come in the days ahead before the search giant decides to make this product official. Revisit our exhaustive review of the Samsung Galaxy S5 Mini!